The Master Chorale of Saddleback Valley has the honor of being the oldest choral group in Orange County still singing together. Here's a lightning history of the group over the last 50-some years. You can also see a record (incomplete right now) of our concert performances over the years. Check the period you're interested in from the menu. Only the years back to 1994 are online right now, and there are missing pieces, especially in the earlier years. The group began in 1963 in Laguna Beach when Ms. Doris Shields, the choir director for the Neighborhood Congregational Church of Laguna Beach, was asked to pull together a choral group to sing background music for the Pageant of the Masters summer show. She auditioned dozens of people from all over Orange County and eventually assembled a group of 25 outstanding singers. This group came to be known as the Festival of Arts Chorale, our first incarnation. When that first season came to a close, Mrs. Shields was determined to find a way of keeping this fine group of vocal musicians together. The timely 400th anniversary of the birth of William Shakespeare provided the catalyst for her plans. She and the Festival Board decided to stage a special performance for this anniversary event and to showcase these talented singers in the show. Although their performances at the Pageant of the Masters lasted only for two seasons, the group remained busy singing at various other events throughout Laguna Beach, and their association with the Pageant remained for several more years. Ms. Shields handed over the artistic direction of the Festival Chorale (shortened from the Festival of Arts Chorale) to Ms. Marilyn “Mitzi” Interlandi in 1968. Her tenure as the new director lasted until 1970 when she had family obligations that demanded more of her time. Although no longer the director of the group, Mitzi Interlandi continued to perform with the group as a soloist. From 1970 to 1973, Mr. Jack Krefting served as the group’s musical director. Along with a new leader came a new name for the group: The Laguna Festival Chorale. The group continued to perform at local events and concerts in and around Laguna Beach, and as far away as San Diego. In the fall of 1973, Dr. Jonah Kliewer assumed the duties as musical director and the group changed names again, becoming the Laguna Concert Chorale. By 1974 the Chorale had grown to some 75 singers. Dr. Kliewer reinstated the concerts on the green, which had originally taken place under Doris Shields’ leadership. These concerts featured classical choral pieces, such as Bach’s Passion of St. Matthew. A year later the group began its affiliation with the Saddleback Community College, and assumed the name of the Saddleback Concert Chorale. 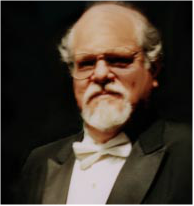 Mr. Don Walker, a music instructor at the college, took over the musical director position. Under his leadership and with the fortunate access to a pool of talented students the Chorale grew to over 100 members. Its reputation for excellence in choral music continued. During this time the Chorale performed while touring in Europe and Mexico, and it was during this period that the Chorale was featured on the Swedish National Radio as an example of excellence in choral music in Southern California. Mr. Walker served as the group’s director from 1975 to 1982. In 1990 the large group again took a new name, the Saddleback Master Chorale, and at that same time a smaller select group was also formed, The Saddleback Concert Singers, performing works designed for smaller groups. The piano accompanists, Ms. Pennie Foster (starting in 1969) and her alternate Ms. Gretchen Peregrine (joining the College in 1993), also provided superior support for both groups and remain beloved, appreciated, and highly respected by all the Chorale members who sang with Mr. Brightbill. In 2006 the Chorale separated from Saddleback College and returned to Laguna Beach, to some extent coming full circle. The group had retained the name of the Saddleback Master Chorale and was now a group of some 30 singers under the leadership of Mr. Charles Stephenson, who had sung with the group since 1971 while he was still in high school. The group initially rehearsed and sang primarily at St. Catherine of Siena Catholic Church in Laguna Beach, accompanied by Ken Gilliard. In 2010 the Chorale moved to rehearse at St. Margaret’s Episcopal School in San Juan Capistrano as the group’s membership increased, accompanied now by Adam Bravo, a member of the Music Department at St. Margaret’s. And so, what remained to do at this point? Of course, to change our name again! As of 2013 we are now The Master Chorale of Saddleback Valley. We still love to sing; we still love to perform for the people of Orange County . And we have a ever-expanding repertoire that includes the classics of Mozart, Bach and Brahms, as well as folk songs from Appalachia, Renaissance love songs, opera choruses and music from other parts of the world, such as Mexico, Africa, France and Eastern Europe. in 2014, we presented a concert of choral arrangements of famous pop songs, bringing our range totally up to the minute! We love to sing. Come hear us!